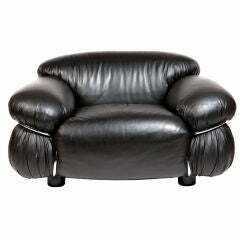 Gianfranco Frattini, lounge chair model 877, black aniline leather and rosewood, made by Cassina, Italy, circa 1959. Sturdy and voluminous lounge chair in black leather, reupholstered in our in-house workshop. This wingback chair shows nice details and elegant lines. The buttons on the outside of the shell looks like brass yet in fact they are made of wood. The seating shows nice vertical lines, which emphasize the high character of this chair and shows the high quality of this design. The 'ears' and armrest are beautifully formed. The wooden frame shows great joints and is a nice open contrast to the closed heavy shell. Gianfranco Frattini (1926-2004) was an Italian designer and architect. Similarly to many other architects, Frattini became an interior and Industrial designer because he missed the specific furnishings for his buildings. Frattini was a very skilled woodworker and was a student of Gio Ponti. His style can be defined by its architectural structure and playful lines. 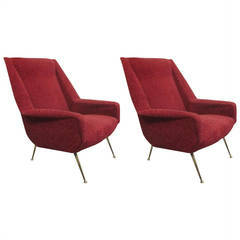 Rare pair of #830 armchairs by Gianfranco Frattini. 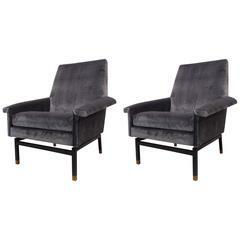 Upholstered armchairs with wide arms and black painted metal legs. Produced by Cassina, and recently reupholstered in gray velvet. 1950s Italian armchair model 849 designed by Gianfranco Frattini for Cassina in 1956, structure in walnut wood and vinyl original upholstery. Some signs due to normal use over time. A pair of "Sesann" lounge chairs with the original black leather upholstery in tubular chrome frames. A lounge chair model 836 by Gianfranco Frattini.